The present mansion house known as The Howe, is a private dwelling situated off the Hedingham Road with commanding views across the Colne Valley. However take a step back in time and discover that The Howe and its estate once consisted of a modest red brick farmhouse and was a busy working farm. Over the centuries property referred to as How Farm, How(e)Ground, Howe House, Howe Park and The Howe have stood near to or where the present house is situated today. The earliest reference to The How(e) appears to be in the Domesday Book when:- “The Howe a manor house near Halstead. Richard Fitzgilbert holds 32½ acres”. In 1547 under the Manor of Hipworth Hall, today Hepworth Hall reference is made to:- “Freeholders of certain land called The How, Sir Thomas Neville, John Perry and some time the Earl of Oxford”. From at least the mid 1700s How(e) Farm was owned by Robert Tweed, a wealthy local gentleman, who preferred to live in a house in Town Street, today called The White House in Halstead High Street. Therefore How(e) Farm was leased to a number of tenant farmers. After Robert Tweed’s death in 1759 the property was inherited by his daughter and only heir Jane who married John Blatch Whaley, a wealthy merchant from Colchester in 1760. How(e) Farm passed to John as part of Jane’s dowry, and although John and Jane preferred to live in Colchester, John took a keen interest in the running of the farm. After John Whaley died in 1788 the farm was purchased by William Start, who lived at Gissing Hall in Norfolk. William was the youngest son of William the elder and Mary Start, who were a well known local Quaker family of bay and say makers. However with the decline of the cloth making industry towards the end of the eighteenth century, families had sought other business interests such as farming, malting and milling. William the elder was no exception and had occupied land in and around Halstead and on the How(e) Estate, which he let out to tenants. Following his death in 1790, William the younger inherited these lands. Not wishing to leave Gissing Hall, How(e) Farm was leased to Jump Crump who was at one time the licensee of the Kings Arms and Red Lion Public Houses in Halstead. According to the Chelmsford Chronicle of 1800 John aged 65 years married secondly Mary Ann Phillips who was 18 years old! Whether this is true or not is open to speculation! Crump died in 1801 and John Sparrow who lived at The Chase, Head Street, rented the farm for a few years, before he bought it from William Start. When Sparrow died in 1816, his trustees continued to run the farm to provide an income for his widow Elizabeth and his young son Jeremiah. Edward May, an ironmonger from Oxford Street, London purchased How(e) Farm in 1824 from Sparrow’s Executors and embarked on a grand rebuilding/revamping and modernisation programme, creating a large magnificent and impressive country mansion. A stylish iron verandah and conservatory were added, and expensive iron fences ran around the property. A beautiful stable block which incorporated a dove cote were built facing the main drive for all visitors to admire. A lodge was erected at the bottom of the drive, and cottages were built for the farm workers. Edward also acquired cottages in Box Mill Lane, Does Corner and at The Wash, Hedingham Road. Edward who was the youngest son of John May, a local farmer, had left for London as a young man, maybe to make his fortune. It appears his business was very successful and that The Howe was more of an investment and country retreat. Edward certainly entertained lavishly on his visits to Halstead, almost as though he wanted to show off his opulence. His young daughter Keren caused quite a scandal in Halstead when she secretly left The Howe one night with a local solicitor Decimus Sewell, who was some years older than herself and they eloped to Gretna Green. Unfortunately during the 1840s the building trade went into a sharp decline and therefore iron furnishings were no longer required. 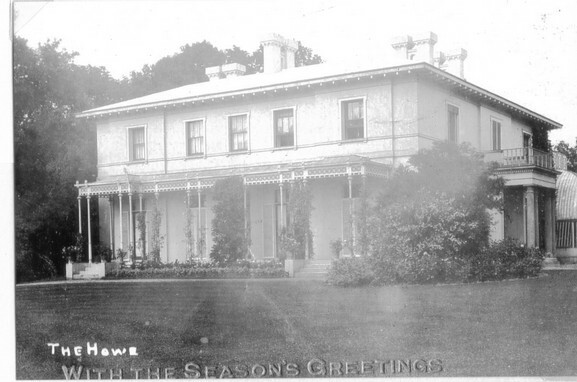 Edward experienced severe financial difficulties, which eventually forced him to sell The Howe and its estate and, all the sumptuous fittings and furnishings inside the house. Even his Newfoundland dog was sold to raise funds. In October 1844 Arthur Macnamara and William Gosset paid £10,260 for The Howe Estate including the house, lodge, and copyhold cottages on Thrifts Hill and Box Mill Lane. A relative of both these gentlemen, Charles Walter lived at The Howe in a caretaking role. Sadly this did not solve Edward’s financial problems and he was declared bankrupt. When his business accounts were produced it showed that Edward was not actually a reckless trader, although it was suggested that his personal expenditure was excessive and he was an extravagant man! A rather sad end to a colourful and flamboyant gentleman. The same could not be said of the next owner, Edward Hornor, a Quaker and staunch temperance gentleman who held rallies and fetes in the Howe Grounds to support the temperance movement. Edward, the son of a Yorkshire dentist, lived at Iver, Buckinghamshire where he established a private licensed asylum. A wealthy gentleman he moved to The Howe Estate in 1845, and became a benefactor to the town. Edward was appointed a Magistrate in 1851 and sat on the South Hinckford Bench. He built the Meeting House for the Society of Friends in Colchester Road, and in 1855 with several other influential gentlemen formed a company whose aim was to bring a railway to Halstead, and eventually the Colne Valley and Halstead Railway was established. Edward was a director of the company and a significant shareholder for a number of years. He believed that all children deserved an education and built the Howe School at the corner of Hedingham Road and Box Mill Lane in 1861, initially for the children of the workers on the estate. The school flourished until it was closed in about 1881 by his widow Anne. Edward was a kind, compassionate man and he opened his grounds to various organisations and societies, and allowed all the different religious denominations in the town to hold their Sunday School treats of tea and games on his land. Following Edward’s death in 1868, Anne remained at The Howe with her unmarried daughters until her death in 1914, when The Howe was purchased by Samuel Courtauld for £17,500. Samuel Augustine Courtauld moved from Little Bradfords, Bocking to The Howe, and promptly built another wing onto the house. SAC, (as I refer to him) was a great benefactor to Bocking, Braintree, Halstead and surrounding villages. He joined the family business in 1884 and his working life was devoted to Courtaulds Limited. When you think of the name ‘Courtauld’ and its association with Halstead many things spring to mind; as well as Courtaulds Factory there are the Courtauld Homes of Rest, The Cottage Hospital and the Courtauld built houses, all these buildings have a connection with SAC who liked to invest his money in bricks and mortar. SAC was a Justice of the Peace, and sat on many local and Essex based committees. He had a strong association with medical institutions and assisted medical research by his generous endowments. The family also owned a large and grand property in London which was situated in millionaires row, and they divided their time between this house and The Howe. The Courtaulds too were gracious hosts and The Howe grounds were open to various organisations to hold functions. Following his wife’s death in 1951 SAC sold his London house and retired to The Howe, where he liked nothing better, than to sit in his study, surrounded by his books, reading, smoking a cigar and enjoying a glass of port. When SAC died his son Augustine Courtauld tried to keep the estate running, but eventually in 1954 the Howe and 42 acres of land were sold to Ralph van Asch, a farmer and engineer. Ralph van Asch was a man with a vision, he intended to create a private estate of individually designed and built houses, something that was very much in its infancy after the Second World War. Ashlong Grove developed out of this dream, although not quite as van Asch had speculated as he too struggled financially and eventually sold out to Duncan Cameron, who completed the project. The Howe was reduced in size and sold at the end of the 1950s, and today is still a private residence. Houses were built in Howe Chase and Howe Drive. Pam Corder-Birch has spent many months researching the history of The Howe Estate, its owners and occupants from 1750 to 1960. She has written a book which was published December 2012. It contains 250 pages and 150 photographs, maps and diagrams. The book includes not only The Howe but also Howe Lodge, Howe Cottages and Howe Ground Cottages, the Bailiffs/Gardeners Cottage, Cottages in Box Mill Lane, The Howe School, Cottages at The Wash and Does Corner. A potted history about the inhabitants of these cottages and dwellings and some of the staff who worked at The Howe are also included. There is a comprehensive chapter relating to the development of Ashlong Grove. or email for further details: pamcorder-birch@hotmail.co.uk.